Into the quarter-finals of the 2017 US Open and it definitely feels as if the tournament is beginning to wrap up. A part of me is kind of relieved as it’s been a challenging one to follow, but it has been a memorable Slam so far! Tuesday saw the first pair of quarter-finals with the number 16 seed, Anastasija Sevastova up against Sloane Stephens in the day session. While Sevastova had just played Maria Sharapova in the last round, this was Sloane’s first match of the tournament on the Arthur Ashe stadium. Edging a three set nailbiter, Stephens advanced to her first US Open semi-final with a 6-3 3-6 7-6(4) win over Sevastova in two hours and 28 minutes. I was watching Bake Off (great episode!) so watched the tennis on catch-up. My brother knew the result so he enjoyed watching me lose my nut during the third set. This was a real grower after two pretty lacklustre sets. There wasn’t much to separate the pair in the opener with Stephens winning the majority of the key points and four of the six deuce games. The American was a touch more solid with Sevastova sending a stream of errors into the net. Sevastova played much better in the second set with intelligent variety and excellent shot placement. Her use of the drop shot was mostly working although she did get tagged at the net a few times! Errors crept into Stephen’s game and Sevastova, who didn’t drop her serve in the second set, forced a decider. Sevastova carried the momentum into the decider and looked to have this – she was increasingly solid and it felt like Stephens didn’t have an answer to break her down. The big game for Stephens was serving at *1-3 where she saved a break point to hold. Stephens’s footwork improved and she was much more aggressive as she tried to open up the court for her forehand – back-to-back FH winners helped her stay in touch. A trio of breaks was followed by a quartet of holds going into a third set tiebreak. I was getting more and more into this match and even if the quality wasn’t quite there, it was gripping because I really didn’t have a clue who was going to take it. Sadly disaster struck in the Moo household – our recording suddenly ended after Stephens held serve at *4-4! In the end, my bro had to tell me who had won – well done, Sloane! A wonderful way to close the match with a backhand winner down-the-line and lovely to see the pair embrace at the net. Gutted for Sevastova who played a fine match for the most part. I’ve run out of superlatives for Stephens. She has been so steady, both in terms of her game and in controlling her emotions, particularly in the key moments. Since first round losses at Wimbledon and Washington, Stephens has won 12 of 14 matches with her only losses coming against top ten players. Take a bow, Sloane. Mega impressed. What a day of women’s tennis as the second quarter-final between Petra Kvitova and Venus Williams was also decided in a third set tiebreak. You can always count on Petra-Venus matches to deliver and my goodness, they did it again! In an almost identical scoreline to Stephens-Sevastova, Venus won, 6-3 3-6 7-6(2) in two hours and 34 minutes. All six of their previous matches have gone the distance and their last four matches have ended with either a 7-5 or 7-6 third set. Incredible respect for both players. Happy for Venus who is absolutely soaring at the Slams this year and is set to crack the world’s top five next week in the rankings. Singapore looks on for Venus. Of course sad for Petra but she’s a champ. I’m excited that we’ll get to see lots more of Petra during the Asian swing where she has always performed strongly. Lovely words from Venus about Petra in the post-match interview. I’m going to try and catch up with the Petra-Venus match tonight so might have more to say about the actual match in tomorrow’s post! For now, here’s a recap of how the match went down by WTA Insider. So we know that the bottom half of the draw will produce an American finalist! Venus vs. Sloane is a very exciting prospect. A very thoughtful but sad read on Tornado Alicia Black’s situation 😢. Tornado reached the US Open girls final back in 2013 where she lost to Ana Konjuh and here’s hoping she find a solution soon. "If I don’t win this match … how are we going to pay the rent this month?" Since the release of the article, Tornado has set up a Go-Fund-Me for her hip surgery – you can donate at the link below and i’ll definitely be contributing later. Switching attention to the top half of the women’s draw, Kaia Kanepi’s press conference from Monday is linked below. She spoke about how proud she was of her comeback and in not giving up. She also mentioned that she is playing pain free, which is great to hear! In Wednesday’s quarter-finals, Karolina Pliskova will play CoCo Vandeweghe first up at 12pm local time. The pair are tied at 2-2 in their head-to-head with all four previous matches being decided in straight sets. Pliskova won their most recent match earlier this year in Stuttgart, 7-6(2) 6-4. Of all the quarter-finals, this is the one where i’m most on the fence as to a winner. Vandeweghe is having another superb Slam run and she’s become a much more mentally rounded player, clearly aided (IMO) by working with Pat Cash through these past few months. She’s been getting up well for the big matches on Ashe. Pliskova played her best match of the tournament in the fourth round vs. Brady, which should give her confidence. Pliskova… just. I’m not brave enough to call the CoCo upset! Madison Keys will play Kaia Kanepi in the first match at night at 19:30pm. Kanepi is enjoying a fabulous run in her first Slam in two years and she’s no stranger to a Slam quarter-final. She’s yet to break through into a semi-final. Keys has broken new ground after that stirring win over Elina Svitolina in the fourth round. Kanepi won their only previous match in Madrid in 2015, 6-4 6-3. At some point, I think all the matches that Kanepi has played (having come through qualifying) will catch up with her. Keys has had great support this week and is attuned to playing at night so I’d take Keys in two. While I wouldn’t be surprised if Kanepi won a set, i’d have serious reservations as to whether Kanepi could control her nerves to get across the finish line against an in-form, Keys. 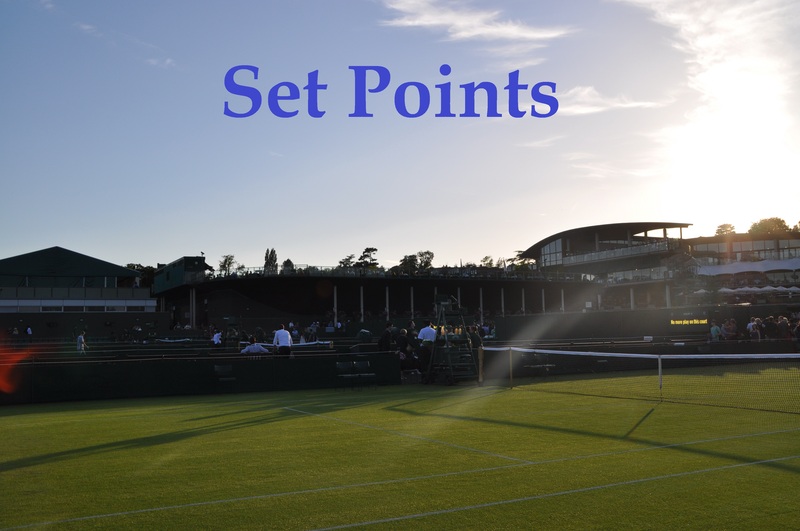 September 6, 2017 in Set Points, US Open, WTA. One thing that could be interesting… Coco FOES upset, then Keys will go on court knowing that if she wins then all four semi finalists are American. When was the last time that even happened? Sorry the predictive texting on my phone is terrible. Of course that should be IF Coco DOES win. I thought exactly the same this morning! That would add another dynamic to Keys-Kanepi. Most likely that thought will be at the back of their minds. Something to aim for in addition to making the semis. I feel the home support has been very positive overall for the Americans who’ve been underachieving in the slams except for the Williams. It wont be undeserved though. It does seem like power baseline tennis rules at this year’s slam, even Sloane is playing with some added aggression and speed. My tennis soul is quite content and the hunger from all the quarter finalists is palpable. If Garbine’s stats this year have been interesting, what do you make of Venus’ slam performance considering her years?! Yeah I totally missed Venus making all 4 slams’ second week! Its funny too because she’s had a horrible year really, outside the majors. The only other notable results were making the QF/SF at Indian Wells & Miami where she lost to the eventual winners on both occasions. I’ve honestly never felt the same awe of Venus as I have of her sister. I can respect her game and all that she’s done for the sport, but I find her play style to be pretty ugly at times and that shriek of hers gives me headaches. I know I’ve picked Karo to win this but I think Sloane could go all the way now and win instead; if Jelena could win the French Open despite the fact that it’s widely acknowledged she still has problems with her serve, why not? She showed in the tiebreak yesterday that she can cope with tough battles and come through at the end. It really is very open at the moment to anyone who is able to step up to the plate and produce their best tennis. Madi could win it (and to be honest she’d be my favourite to win now), so could Coco (though I think that’s a bit less likely), Kaia (likewise) or Venus. But at the moment I’m impressed by the way Sloane’s battling through her matches so if Karo ends up falling short I’m going for her to win. I wouldn’t hate Sloane winning in the slightest. Before she got injured last year I thought she was well on her way to becoming a top ranked player. Halep only 65 points from no, 1. she should enter one of the tournaments next week to try to pick up the no. 1 ranking. This could be her only chance to be numero uno. WTA #1 is very cheap. I hope Venus the whole thing. WTA #1 beat Venus in Wimbledon Final clearly.